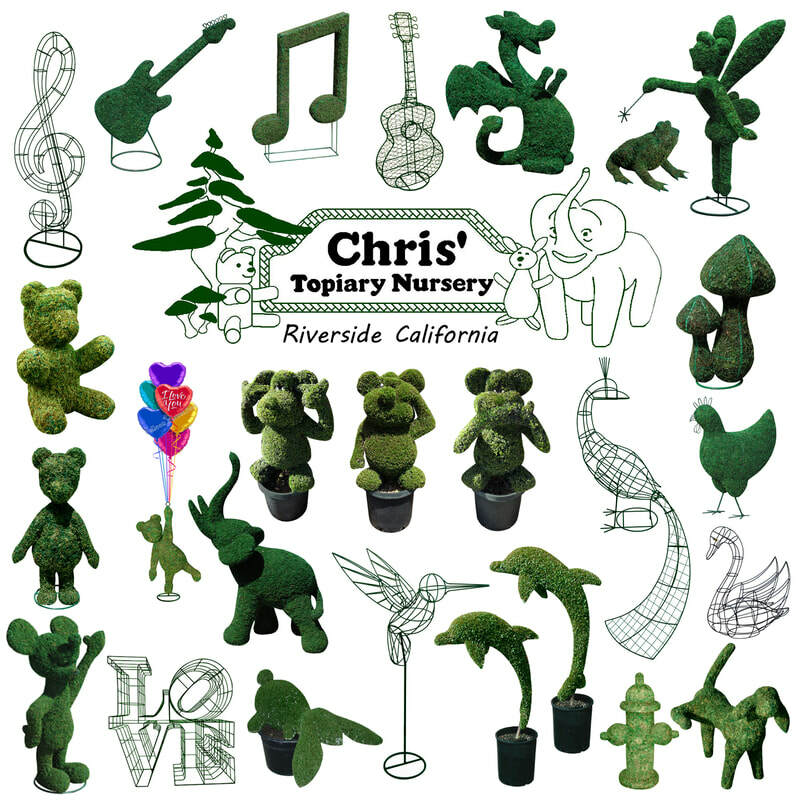 ​To date, Topiary Artist Chris Myers has made 8782 topiary frames and served 6734 satisfied customers. How Did you get started in the Topiary business? Believe it or not, the question I get asked more than any other is "How did I get into the Topiary business?". The short answer may surprise you, God told me to. Let me explain. I graduated from Cal Poly with a degree in Horticulture in 1988. My plans all along had been to get my degree and then start my own nursery business growing and selling general landscape plants. Unfortunately, in the summer of '88 California was in the middle of the worst drought the state had ever seen. Nurseries were going out of business left and right. Starting a nursery at that time was the furthest thing from wisdom possible. "This situation is hopeless." I thought to myself. "What am I going to do?" So, as a Christian, being in the middle of a hopeless situation, I went to the one who specializes in hope, God. I had prayed for guidance in the past and had always felt a little unsure about what the right answer was. This time was very different. The answer, MAKE TOPIARY! came to me clearly and unmistakably. God had spoken to my heart. The conviction was undeniable. I hadn't even thought about topiary before that moment, let alone made any. Was this really what I was supposed to do? YES! So I got to the task of making topiary and I have never looked back. That was 30 years ago. Today, Chris' Topiary Nursery has become a phenomenal success. Oh, probably not in the eyes of the world, certainly not in size nor in money made. It's success story is found in the amount of confidence this humble topiary artist has experienced in God, the one who gives hope. ​Chris' Topiary is a Christ centered business where integrity, product quality, and customer satisfaction are of the highest importance.